Is the pursuit of skill points, not ISK, the root of all evil in EVE Online? 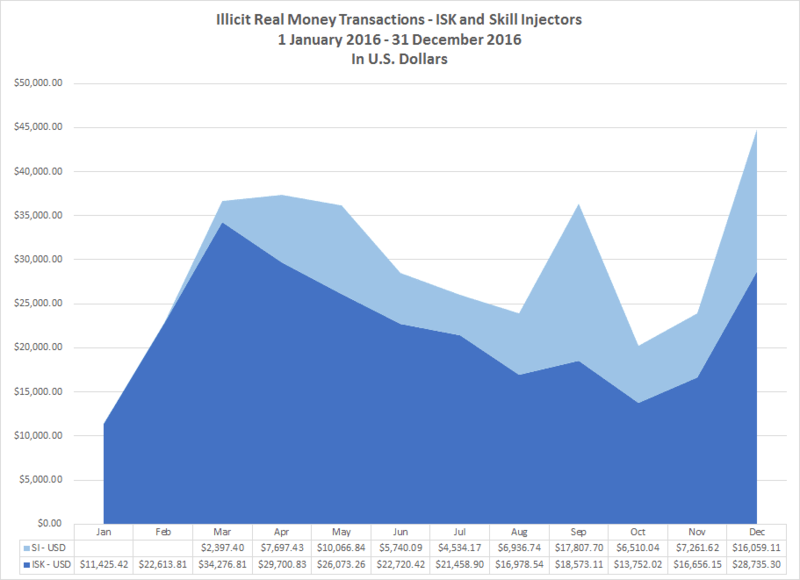 Ever since the introduction of skill extractors and skill injectors in February 2016, one can make a compelling case the answer is yes. I don’t refer just to the explosion in the growth of the black market as players try to stretch the contents of their real-life wallets farther to purchase the most valuable commodity in New Eden. Ship balance changes lead to charges of bait-and-switch tactics on the part of CCP as many players shell out real world bucks in a quest to train to fly whichever ship is flavor of the month, only to see the ship eventually nerfed. We’ve even witnessed instances of unscrupulous corporation and alliance leaders pressuring new players into purchasing skill injectors off the local market they stock in order to make in-game wealth for themselves. I thought I successfully escaped the skill point trap. I had no desire to extract any skill points from any of my characters. Some day in the medium-scale future, players will miss all those extracted skill points spent on a fit CCP nerfs into the ground. Profiting from the changes by establishing a zombie farm also held no attraction. More politely called skill point farms, the zombie farmer creates accounts specifically to extract skill points from the characters to sell on the market. A very Blood Raider type of activity, but my characters are Minmatar and we have different religious rites. Besides, maintaining a sizable farm (some farms have over 100 characters) reminds me too much of planetary interaction. Sure, the activities are profitable, but I’d rather fly around in space. Zombie farmers found themselves the stars of two controversies that placed CCP in a bad light in 2017. The first was the fiasco at Fanfest 2016 involving CONCORD ships. Last year’s event featured a giveaway to attendees of two player-flyable CONCORD ships a few months before the ships appeared as prizes in Project Discovery. Instead of giving the prize ships away one per event ticket, as per the previous practice, attendees received one shipper account tied to the email address of the account linked to the ticket. Once the news broke about the change in the giveaway, outrage broke out, especially as some of the larger scale zombie farmers started selling their ships on the markets making hundreds of billions in ISK. Another, darker piece of news emerged from Reykjavik that impacted the zombie farmers. Since the introduction of alpha clones in November 2016, an exploit called “ghost training” emerged that ensnared people who just left the game and had no idea their skill points continued to accrue. When CCP asked for the skill points back, some of the farmers had to liquidate ships and modules, often at extremely unfavorable rates, to clear their accounts. 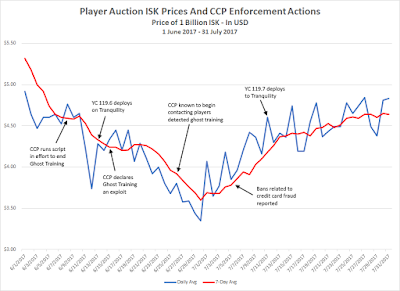 The extent of the use of ghost training by real money trading operations became apparent in June 2017 when ISK sellers began dumping ISK onto the black market to salvage some of the value of their inventory before CCP confiscated their accounts. I thought I had beat the skill point trap. I didn’t find myself with the headaches associated with the riches zombie farmers made in selling skill injectors. And with all my characters with over 80 million skill points, spending 700-800 million ISK on a skill injector for 150,000 skill points provided no temptation at all. I was home free. Or so I thought. Most MMORPGs run holiday events based around PvE, with EVE Online an exception to the rule for most of its existence. Over the past two years CCP jumped on the bandwagon, slowly working out the reward mix of SKINs, faction gear, and cerebral accelerators we know today. Cerebral accelerators, for those unfamiliar with EVE, are a type of experience point potion that works for between 1 and 6 days, depending on the type of accelerator and the character’s skill level in Biology. Did I mention the accelerator works while the character is offline? I found myself hooked on cerebral accelerators once I discovered that I could get over 750,000 skill points by consuming the skill buffing items that dropped during each two-week event. I didn’t just get enough accelerators for one character. Not me. I ran the event sites until I had enough for all three of the characters I actively train. Almost 2.3 million skill points per event. I told myself the events were fun. I used the excuse that the sites provided fresh PvE content I could do in low sec. For a couple of events, the excuses resembled reality. I had a character run sites exclusively in high sec, and the other in low sec. I compared the drop rates to see exactly the rewards CCP thought it had to offer players to venture into low sec. I had the situation under control, or so I thought. The reality of the situation became all too plain in February during the Guardian’s Gala event. CCP introduced an NPC behavior new to seasonal/holiday events, if not to null sec PvE. The Guardian Angels in the event sites, when too far from player ships, would warp to a ping and then warp on top of the player ship. The basic tech 1 cruisers I liked to run the sites in no longer worked and I upgraded to a command ship, the Claymore. The necessity of upgrading to a more expensive ship also led me to spend the entire two weeks the event ran in high sec. How far I had fallen didn’t strike me until Sunday night. The grind in the current event, The Hunt, became longer as the number of sites needed to run every day to reach the 700-point prize, a 3-day cerebral accelerator, rose from three during Guardian’s Gala up to five. The sheer tank on the Rattlesnakes the boss NPCs fly in The Hunt meant once again abandoning my trusty Arbitrator for a Claymore. For six days I shared the Claymore between my two main characters. 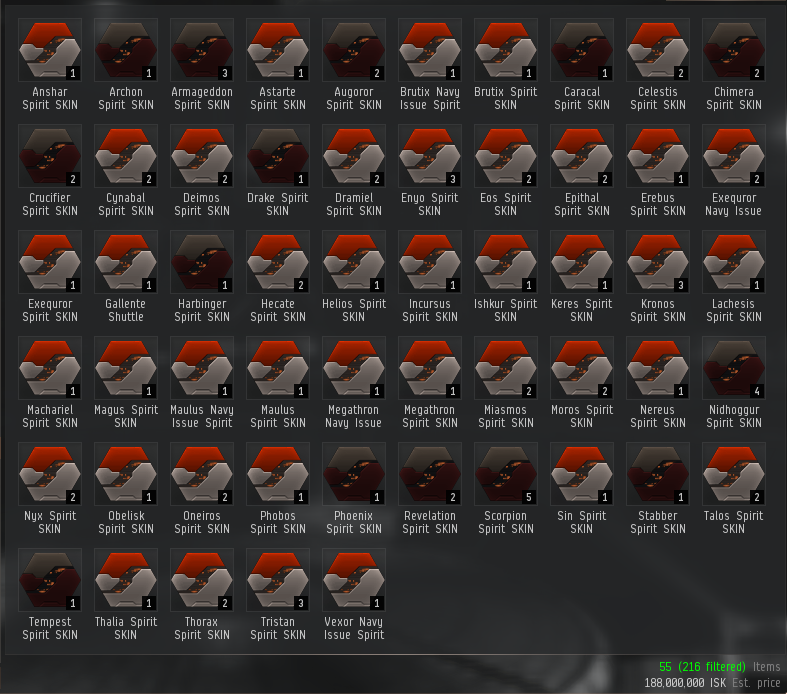 When I looked in my shared cargo container holding the loot, I saw the value of the drops listed at over 2 billion ISK. But I didn’t focus on a number I’d never reached before doing PvE in EVE. I checked to see if I had enough accelerators to last until 24 April, when the next release hits, the current batch of accelerators expires, and presumably CCP launches the next event. Yes, I had enough accelerators, but they weren’t all the advanced type that gave +12 to all learning attributes instead of +10. I’d become a skill point junkie. Looking back, I realized I’d put aside some of my plans to pursue my need for skill points. My dream of mapping all the low sec moons in the Minmatar Republic came to a screeching halt after finishing the region of Metropolis. I likely would have completed one of the other Matari regions by now if I didn’t become diverted. Progress in my quest to obtain the Marshal, the CONCORD battleship available by reaching level 500 in Project Discovery, slowed down significantly. I haven’t even reached level 400 yet. Most importantly, however, is my years-long dream of establishing bases throughout New Eden that I can clone-jump to, depending on what I wish to do each night. I have a nice little network of stocked stations in Heimatar and Metropolis, but I want to expand my little operation into other empires. Finding a new low sec system in which to mine and setting up shop in the Gallente COSMOS constellation are my current priorities. Instead of chasing the opportunities in New Eden, I instead made the pursuit of skill points the centerpiece of my time spent playing EVE. I could feel the desire to play ebb as the grind became more of a grind I had to do instead of a fun activity to kill 10-20 minutes I couldn’t spend doing something more involved in space. So, I just stopped and haven’t run a site since. Am I done with running event sites forever? Hardly. The payouts are way too lucrative to give up entirely. What I need to do is treat running the seasonal event sites like I treat mining. High sec mining is a boring and tedious activity that I only engage in when I must. Solo low sec mining gives the activity a little spice as planning, situational awareness, and a little piloting skill come into play. In the future, I’ll try to restrict my event running to low sec, if only to keep turning my mind into a bowl full of mush. One of the subjects that often swirls around the EVE media around the time of the elections for the Council of Stellar Management is war decs. The war declaration system provides a way for player groups in EVE Online to place a PvP tag on each other, so they can fight in high security space or avoid gate and station guns in low security space. The slight twist compared to other MMORPGs is that the tagging in the vast majority of cases is non-consensual. The situation often leads to entire groups of players just not logging into EVE for a week at a time. A game system that encourages players not to log into the game is sub-optimal and in need of change. Yet, that is the state of affairs in EVE today. While many believe that the war dec system is an affront to those who prefer player verses environment play, another system currently is Asia debuts in North America and Europe this spring. Bless Online, a PvP-centric title once eagerly awaited in the West, will limp onto Steam in May. I could go into details such as the game failing in South Korea or how during the western localization process the number of classes dropped from 8 down to 5. Instead, I will focus on the business model of the game and its direct impact on those who do not like to PvP. Neowiz, the developers of Bless Online, last week announced the game will be a buy-to-play game with a cash shop. Pretty basic stuff. One of the items, however, quickly grabbed my interest and I did a quick search of the internet to make sure the information was correct. Part of the business model is to make players pay real life money if they wish immunity from PvP. In my nine years of writing about MMORPGs on The Nosy Gamer, I don’t recall ever seeing the Pay-to-PvE model implemented before. I imagine the model resembles boiling a frog by slowly raising the temperature of the water in the pot. At the lowest levels, players will run around in zones worry free. Once past the newbie zones, players can obtain a consumable which grants some sort of PvE flag that lasts a limited amount of time, like 10-15 minutes. Players obtain the consumable either from the cash shop or a source in the game. Finally, once the player reaches the level cap, the PvE buff is only available through the cash shop. I can’t honestly state the idea of players paying to exempt themselves from PvP shocks me. A couple of years ago I came up with an idea for changing the war dec system that allowed players and corporations to pay a fee to an NPC that would grant immunity from war decs within a certain area. Knowing EVE players, a small percentage of the player base would wind up paying for war dec immunity by whipping out their credit cards and purchasing PLEX to turn into ISK. I should add that CCP does charge players a fee of 11% on all bounties and mission rewards for staying in NPC corporations are immune from war decs. Still, the chutzpah of the developers at Neowiz charging players for the ability to engage in uninterrupted PvE in a PvP-centric game is astounding. In the case of EVE, players just receive a reduced ISK payout for PvE activity. I much prefer a system in which a corporation could somehow immunize itself from war decs by not building structures than by purchasing immunity with real world money. But what do I know? Maybe charging players to engage in PvE is the new normal. And perhaps pigs can fly. Wow, time flies! In a little over two weeks time I head to the airport for my seventh trip to Iceland to attend CCP's annual Fanfest held in the Harpa. Over the last few years, Fanfest served as the event that ended frantic days of CSM coverage and recharged my game playing batteries. This year, though, I expect to have a bit of a working vacation, as we don't learn the final candidate list until the event. 52 #CSM13 applications have been submitted at this time. Applications close at noon today. Fanfest starts affecting all facets of my life. For instance, I need to file my tax returns because I don't plan on returning until after April 15th. I also need to check all my electronics. I might buy a new laptop or tablet that is lighter than my current model. Plus, my current laptop cannot run EVE. I may need to send some mail to people while in Reykjavik. Did I mention I need a haircut? This year I plan on doing a little sightseeing. I really need to go on a tour of the south coast of Iceland, probably on Tuesday. I see that I can also visit a lava tunnel in a 3-hour tour. Fortunately I don't need to make a decision now, but I have options besides EVE-related events. Once again I intend on picking up the pace of my blogging while in Iceland, even if the posts don't involve more than a picture or two. I hope to meet new and interesting people and learn a few things some people will want to read about. But now I have to return to the real world and put thoughts of far away places away until tomorrow. Starting with the election of the 8th Council of Stellar Management, CCP has used a modified version of the Wright single transferable vote system (STV) to conduct all elections. Before 2013, CSM elections were conducted using widely used First Past the Post (FPTP) system. Players would cast votes for a single candidate per account, with the 14 candidates receiving the most votes becoming either members of the CSM going to the summits in Reykjavik or serving as alternates. A simple to understand way of conducting an election. "The Single Transferable Vote (STV) is a form of proportional representation voting system which uses preferential voting, usually in multi-member constituencies. Candidates don’t need a majority of votes to be elected; all they require is a known ‘quota’, or share of the votes, determined by dividing the number of valid votes cast by the number of positions to be filled, plus one..."
"Under STV, an elector has a single vote that is expressed by ranking the candidates in preference from ‘1’ until the elector cannot choose between the remaining candidates. As the count proceeds and candidates are either elected or eliminated, this vote can be transferred to other candidates according to the voter’s stated preferences. In a Single Transferable Voting system very few votes are wasted; unlike other voting systems, particularly First Past the Post, where the votes of all but the winning candidate are wasted." "STV is arguably a much more representative and inclusive voting system as it gives voters more choice than any other system. This choice puts more power in the hands of voters, rather than the political parties: under other voting systems political parties can more easily determine who is elected. Under STV some would say that an elected representative is much more accountable to the electorate than to their party superiors." When voters can rank candidates, the most disliked candidate cannot win, as they are unlikely to pick up second, third and lower-preference votes. By encouraging candidates to seek first, as well as lower-preference votes, STV removes the need for tactical voting. Tactical voting is when a voter supports another candidate more strongly than their sincere preference to prevent an undesirable outcome. A system allowing voters to rank candidates is prone to behavior termed ‘donkey voting’, where voters vote for candidates in the order they appear on the ballot. CCP fights against donkey voting by randomizing the candidate list for each vote. "The system uses the optional Droop quota (the integer value of the total number of votes divided by one more than the number of vacant positions plus one) and the Gregory method of weighted surplus transfer value of the vote in calculating a candidate's surplus transfer value which is then multiplied by the value of each vote received by the candidates whose votes are to be redistributed, as is the case in the Western Australian upper-house elections. "Unlike the Western Australian upper-house electoral system, the Wright System uses a reiterative counting process that differs from the Meek's method as an alternative to the method of segmentation and distribution of excluded candidates' votes. "On every exclusion of a candidate from the count the counting of the ballot is reset and all valid votes are redistributed to candidates remaining in the count initially at full value. "In each iteration of the count, votes are first distributed according to the voter's first available preference, with each vote assigned a value of one and the total number of votes tabulated for each candidate and the quota calculated on the value of the total number of valid votes using the Droop quota method. "Any candidate that has a total value equal or greater than the quota is provisionally declared elected and their surplus value distributed according to the voter's nominated subsequent preference. If the number of vacancies are filled on the first distribution the results of the election are declared with all provisionally declared candidates being declared the winner of the election. "If the number of candidates provisionally declared elected is less than the number of vacancies and all candidates' surplus votes have been distributed then the candidate with the lowest value of votes is excluded from the count. The ballot is reset and the process of redistribution restarted with ballot papers being redistributed again according to the voters next available preference allocated to any continuing candidate. This process repeats itself until all vacancies are filled in a single count without the need for any further exclusions. "The Wright System takes into account optional preferential voting in that any votes that do not express a valid preference for a continuing candidate are set aside without-value and the quota is recalculated on each iteration of the count following the distribution of the first available preference. Votes that exhaust as a result of a candidate's surplus transfer are set aside with the value associated with the transfer in which they exhausted." Confused? I was when CCP first announced the use of STV in 2013, the dev blog instructed players to visit Wikipedia for an explanation. I needed an example before I truly understood how the algorithm worked. Having covered five CSM elections using the STV, I think I can do a little better than the generic mechanical explanation. In the below example, I will not only go through the mechanics, but introduce some of the situations that occur in a CSM election. In our example election, 8 candidates are vying for 4 seats. We can divide the candidates into 3 security zones, each with their own political dynamics. Goonswarm Federation (GSF) - Goonswarm historically is the electoral powerhouse in CSM elections. In our example, GSF is running two candidates, Aryth and Innominate, winners in both the CSM 11 and CSM 12 elections. The Goon campaign team usually supports other null sec entities, so will finish off their voting slate by supporting candidates from fellow Imperium member The Bastion as well as Brave Collective. The Bastion - Smaller alliances within the Imperium often attempt to win a seat on the CSM. In our example, The Bastion's Sullen Decimus, a member of CSM 11, will try to win a third seat for the Imperium. The Bastion made a deal with Brave Collective to put his name second on their ballot if The Bastion would do the same for Brave's candidate. Brave Collective - Brave always seems to win whenever they officially back a candidate in a CSM election. In our example, Brave will run CSM 12 member Yukiko Kami. Brave's voting slate will mirror The Bastion's, except for putting Yukiko in the top slot and moving Sullen down to the second spot. Wormhole space: The dynamic in wormhole space is a little different than in null sec. Instead of working within established major blocs, wormholers got together and two candidates, Noobman and ExookiZ, rose to the top. 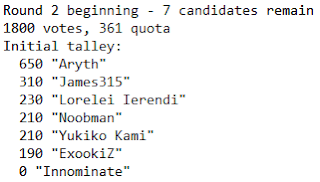 The backers of each candidate promised to put the other faction's candidate in the number two slot to ensure at least one wormhole candidate would win. 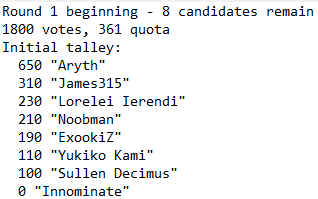 Wormholers didn't care about candidates from k-space, but didn't want to waste the other two slots, so filled them in with Sullen Decimus and Yukiko Kami. High sec gankers: The high sec ganking community is very loud, very passionate, but very small. To maximize turnout, the famous ganker James315 is running in our election. Since Goonswarm's Ministry of Love often operates with the gankers in high sec, James315 fills the remaining three slots on the ballot with members of the Imperium. High sec carebears: To say that high sec miners, mission runners, and haulers do not like high sec gankers is an understatement. But the residents of high sec, with the exception of the gankers, are a pretty apathetic lot. The turnout from those who enjoy PvE in high sec is usually very low. Additionally, in our example, they could only come up with two other candidates to vote for: Sullen because he did some mining stuff on CSM 11 and ExookiZ due to giving some presentations at Fanfest. The initial quota is 361. 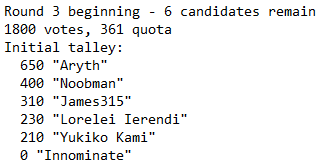 The number of votes for each candidate at the beginning of the round is below. Since the voting does not have 4 winners, the algorithm removes the candidate with the lowest vote total, Sullen Decimus, and distributes his votes to the number two candidate on The Bastion ballot, Yukiko Kami. Not much happens in the round. Once again, Innominate receives the overflow vote from Aryth to stay in contention for a seat. Since the voting does not have 4 winners, the candidate with the lowest vote total, ExookiZ, is eliminated and his votes distributed to the number two candidate on the Wormhole #2 ballot, Noobman. With the elimination of Lorelei Ierendi in round 3, the high sec carebear voting slate expires, reducing the number of ballots from 1800 down to 1570 votes. The result is a decrease in the quota from 361 down to 315. The reduction of the quota increases the trickle-down from the candidates who already exceeded the quota. So instead of Innominate receiving 289 of Aryth's excess votes, he receives 335 votes. Yukiko receives more votes from Noobman, increasing his total from 39 to 85 votes. 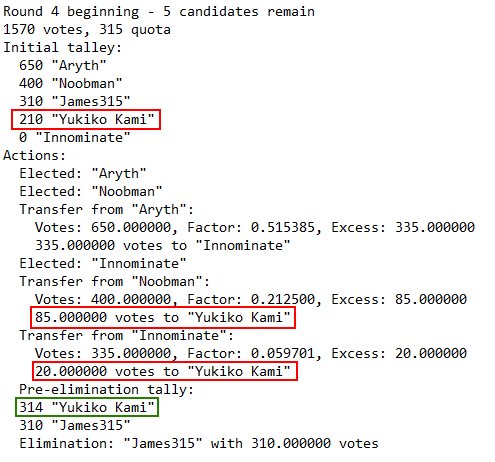 Due to the decreased quota, Innominate exceeds the quota by 20, winning the third seat and passing those votes to Yukiko as well. I'm not exactly sure why the algorithm indicates Yukiko had only 314 votes while the actions during the round show Yukiko should have 315 votes. Either way, Yukiko surpasses James315's vote total of 310 and wins the final seat. Perhaps a game as famous for its complexity as EVE Online should use a complex voting system like the modified Wright single transferable vote for determining the winners of the Council of Stellar Management election. Others may argue that using a single transferable voting system adds needless complexity to an election that historically has low voter turnout. I just wish I didn't need to write a 2100 word essay in order to explain how the voting system works. What I deem the EVE silly season, known to players who know about the event as the Council of Stellar Management elections, officially kicks off this year on Monday, 19 March. Once again, I plan to cover the event both here on The Nosy Gamer as well as on my election campaign coverage site CSM Wire. But before getting into my planned coverage, I probably need to cover what the heck a CSM is first. The Council of Stellar Management is a body of 10 players chosen by the EVE player base to “represent” the players to the game’s developers. I used scare quotes because CSM members do not have the same type of power as a legislative body in a Western-style democracy. Think Beijing, not Westminster. In other words, the CSM does not get to dictate the developmental roadmap of EVE Online. In some respects, the CSM acts as a player focus group, with the development staff bouncing ideas off the members. The most visible sign to the player base are the two summits between CCP and the CSM held every year in Reykjavik, Iceland. The CSM and CCP also hold weekly meetings where they also discuss issues, with the meetings recorded for later viewing by those unable to attend due to real life concerns such as work. Unlike a normal focus group, the CSM maintains in contact with the developers year-round (or at least when the office isn’t vacant due to the staff going on holiday). In addition to text chat, the CSM has access to the developers’ Confluence, CCP’s internal wiki. Where the term representative comes closer to the ideal of a representative body is when the CSM interacts with the players. The members of the CSM often act as a communications conduit between CCP and the players, explaining actions in ways that CCP’s messaging sometimes sugarcoats. Members also reach out to the player base looking for feedback on certain areas that CCP may explore in the future. The members of the CSM are elected to a one-year term in an election based on a modified Wright single transferable vote system. 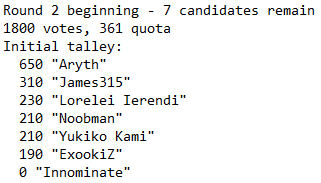 Players with a subscribed account (aka Omega accounts) may vote for up to 10 candidates, with an algorithm determining the winners. Players can cast as many votes as they have subscribed accounts. Theoretically, a player running a 100 account skill point farm could vote 100 times. This year, CCP changed the timeline of the election. Instead of holding the election in February or March and announcing the results at Fanfest, the official kick-off of the campaign begins at Fanfest with the announcement of the candidates. The application period only runs for five days, from 19-23 March. Firm dates for the election itself are not available, but the announced time frame is sometime in late April or May. Afterwards, the CSM will onboard during the traditionally quiet summer season when the CCP staff are off on holiday. My planned coverage on the blog is to try to explain some of the details around the election. For example, the single transferable vote is pretty complex and a turnoff to a lot of people. As for CSM Wire, I will only include those candidates who post in the campaign thread on the official forums until the official candidate list is announced at Fanfest. Since the instructions to candidates suggests making a post, I hope candidates start posting as soon as they apply and don't wait until the Fanfest announcement. I currently don't plan on updating the site while I am in Reykjavik with new candidate pages. Deleting a page is easy. Creating pages takes some time, and I'd rather spend that time running around Iceland and talking to people I only get to see once a year. Currently, 7 candidates have posted campaign threads, with several current CSM members yet to publicly declare. I expect to see a lot more people running this year, as many candidates are working behind the scenes trying to gather support. To everyone running, good luck! With the end of the Guardian's Gala event I thought I would try something a little different. Normally most people, including myself, give previews of the events. Hardly anyone ever looks back at the event. After getting one character up to the 700 point prize and another up to the 500 point prize, I think I can provide a valid perspective on the event. First, an overall opinion. The Guardian's Gala event was not designed for newer players (or at least, newer players who had not purchased skill injectors). With the changes to the Alpha skill set and the ships they can now fly, sufficiently skilled Alpha characters could run the sites. I think their best choices were shield-based ships like the Drake and Cyclone, with the Gila a viable option for returning players with the skills. I’m not sure how many new Alpha characters have the skills to fly the Gila well. I used a Claymore, a Minmatar command ship, to run the sites. I chose the Claymore because, in addition to the ship’s inherent tech 2 resist profile, the ship gives bonuses to both missile rate-of-fire and active tanking. I also chose to fit two command burst modules to enhance the ship’s defenses. While the event NPCs never broke through my shields into armor, I did go through a fair amount of command burst charges and Cap Booster 400s powering my Xtra-Large Ancillary Shield booster. I also did not lose a drone during the event, with my drone repair costs totaling under 50,000 ISK. To end the breakdown of consumables, I used approximately 50,000 Nova heavy missiles. I chose to go with the tech 1 missiles because at the beginning of the event I made the determination that the event was not worth using tech 2 or faction missiles to complete. I might have used tech 2 missiles if I ran any sites in low security space, if only to clear the sites faster to avoid interlopers attempting to kill me. Now for a couple of details I did not learn from my testing on Singularity. First, warping into the sites at 50km and then aligning at speed to a celestial produced an interesting response from the NPCs. The frigates would warp to a perch and then warp down on top of my ship. The cruisers, on the other hand, would start to slow boat toward my ship. If I could fire fast enough, I could kill the initial cruisers in the site before the frigates could reach me to apply webs. Next, I found out that when the loot ships appeared on grid within 100km, the best course of action was to turn around and close the range, as the ships would not leave grid to bounce closer. Turning around also gave me a chance to kill more frigates, which upped the number of event NPCs I could kill in each site. The last change involved other players warping into the site. The player closest to the structure would gain the most aggro to the NPCs. At first, I would enter the sites at 100km to make the NPCs have to travel farther on the theory that would mitigate the amount of damage I took. That plan worked but left me vulnerable to having a site swiped. The move to warping in at 50km was an effort to counter the stealing gameplay. CCP also instituted a couple of balance changes to the event sites. The most noticeable occurred on the third day of the event. Once the boss ship with the loot was defeated, the NPCs would pack up and leave the site. Before the change, the NPCs would continue to web the ship down and try to kill you. The change to the NPCs giving up and warping off was very welcome and led to quicker completion of the sites. The next area to look at is the event prizes. The event gave players prizes for reaching 100, 300, 500, and 700 event points. The minimum number of sites one could run to get to the 700 points was 42, or three per day if one logged in every day of the event. I thought the prizes for the first three plateaus were appropriate for the level of work. At 100 points was a new type of firework, which was also a drop. I wound up with 5900 of the fireworks. At 300 points, CCP rewarded players with an advanced skill accelerator with granted players a +12 bonus to all learning attributes for 24 hours (48 hours if the character trained Biology V). These advanced accelerators, along with the standard accelerators that only provide a +10 bonus to all learning attributes, also dropped during the event. The premier reward was a new type of implant that gave a +5% boost to web range. These implants dropped in the VIP rooms, which only spawned outside of high sec. For high sec players, the only chance to get one of these implants was to reach 500 event points. The 700 point reward, a 72-hour accelerator that granted a +10 bonus to all learning attributes (144 hours with Biology V), I felt was optional. In high sec, the drop rate was about 2%, so if one dropped, the final reward was a bonus for either an alt or selling on the market. If CCP wanted a prize that people wouldn't feel required to grind towards and burn themselves out, I believe they succeeded. One of the most popular questions about events like the Guardian's Gala is whether the rewards make the event worth running. Over the course of the event, I completed 92 event sites in approximately 15 hours. I consumed a little over 10 million ISK worth of command charges, cap charges, and heavy missiles during the two weeks of the event. Those are the costs. Now for the rewards. Something I failed to notice during testing on Singularity is that the "boss" NPCs granted bounties. The Guardian Angels battlecruiser paid 250,000 ISK while the battleship paid 400,000 ISK. Surprisingly, the battleships appeared 57.6% of the time. All told, I received 31,100,000 ISK in bounties during the event. Obviously, the bounties are present just to recoup ammunition costs. The drops are where the real ISK is made. The boss NPCs dropped four types of items in high sec: 30-minute stat boosters, fireworks, SKINs, and learning accelerators. I didn't keep track of the booster drops, as I don't use them and didn't think about doing an after-event post until the Guardian's Gala completed. I'm going to estimate a 40% drop rate, as I seemed to receive either a booster or an accelerator with each event site completed. I received 5900 of the new Angels Arisen firework for a 64% drop rate. Fireworks, while cool, don't provide too much ISK. Ship SKINs (or Super Kerr-Induced Nanocoatings) do bring in some ISK when not just activated for personal use. I received 55 unique SKINs and 88 total SKINs. At this point, I wonder if I just misplaced 4 SKINs as what I have currently listed is a 95.6% drop rate. I'm not sure why some of the icons are different. Perhaps they were added for this year's event. But when adding the value listed above to the bounties for completing sites, the ISK/hour was only 14 million ISK/hour. Before moving on to accelerators, I want to mention the implants that dropped in the VIP rooms. Players running the event only in high sec had access to the 5% web boost implant available as the 500 point reward. Yesterday, the implant sold for an average of 53 million ISK. That pushed my ISK/hour up to 21 million ISK/hour. Skill points are the most valuable commodity in EVE, so the fact that the learning accelerators bring in the most ISK should not come as a surprise. I received 55 standard (+10 bonus) and advanced (+12 bonus) accelerators for a 59.8% drop rate. I also received 2 of the 72-hour Serpentis accelerators for a 2.1% drop rate. Add in the 2 advanced accelerators and 1 Serpentis accelerator I received as event rewards, and I had a lot of accelerators. I am currently consuming my remaining advanced accelerators and plan to finish my advanced training period by consuming the Serpentis accelerators at the end. I wound up selling 15 of the standard accelerators to buy orders in Rens for 11.5 million ISK each. The additional 172 million ISK pushed my ISK/hour up to 32.5 million ISK/hour. The additional boost to my training is the real reason I run these events. Keeping characters training with skill boosters throughout the period nets over 750,000 skill points. I am doing that for two characters, with a third joining about 10 days into the event. Since all my characters currently training are over 80 million skill points, I would have to purchase 5 large skill injectors in order to get 750,000 skill points. I figure that over all three characters I will receive approximately 13 large skill injectors worth of points. Buying 13 large skill injectors in Jita would cost 10.5 billion ISK using yesterday's average price of 808 million ISK. I don't know of too many activities in EVE where I can get that type of cash for only 15 hours of work. For myself, I find events like the Guardian's Gala worth the time reward wise. I will say I was sick of running the sites by the end. After the fascination with the challenge of the new NPC behavior wore off, a PvE grind is a PvE grind, no matter what game I play. For the next event, though, I need to limit my ambitions. Getting all the skill points possible is hard to resist. 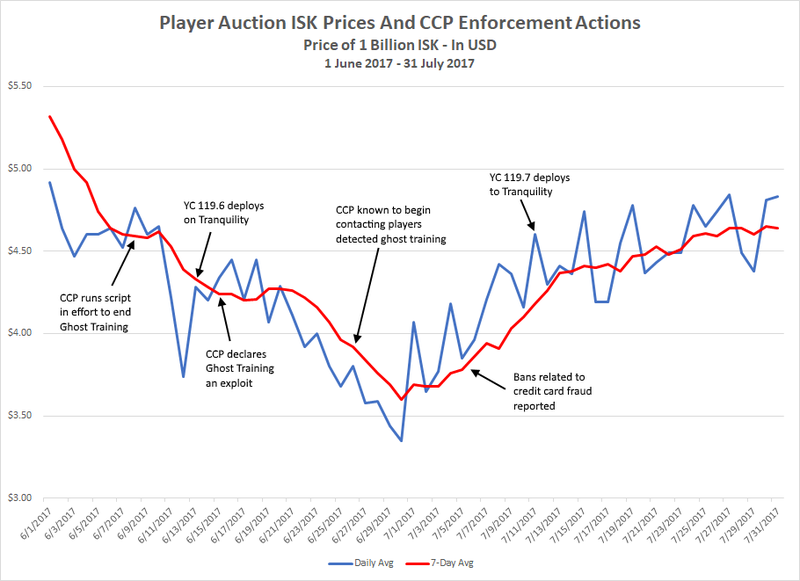 "The damage the bots do is not to the game’s economy, it is their visibility and the perception that CCP isn’t doing anything about them that causes hurt. The developers know there will always be some bots to combat - 'No game has ever completely gotten rid of this problem,' CCP Guard says. 'We think of it more like a war of attrition.' Even so, CCP need to convey that they /are/ fighting them and that players who report bots are helping to clear the game of RMTs." One of the major challenges to covering CCP's War On Bots and Illicit RMT™ is detecting ban waves. CCP didn't make a big deal out of them. In January, I had the surreal experience of watching a major anti-RMT/botting operation unfolding while at the same time the EVE Online sub-reddit, official forums, and even the gaming media exploded about CCP's inaction against botting. Apparently, CCP has changed its strategy, offering up the security team for interview with outlets like Kotaku and PCGamersN. CCP Guard, CCP Peligro, and CCP Grimmi even showed up on the Talking in Stations podcast to talk about their efforts.